I have my 2008 KTM 450 for Sale that is eye-catching bright orange and is like showroom new! I have only ridden the ATV for sale in the yard of our home and it's never been ragged out, raced or on the trails. When I bought the ATV at the dealership I paid nearly $10,000 for it brand new. Now I'm willing to offer somebody a great bargain and huge discount on what they would have to pay for a 2009. If you're interested or have questions you may leave your questions and contact information in the space below provided by Strike Lightning for listing Used Motorcycles for Sale and the owner will get back with you as soon as possible. Strike Lightning would also encourage bikers to submit a review of the 2008 KTM 450 for Sale to help potential buyers make informed decisions and to benefit the powersports community. 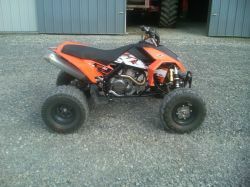 The KTM 450 for sale is located in Uhrichsville,Ohio and my asking price is $7,800.00!